How Does Toe Twitching Treat Bladder Issues? What is the Tibial Nerve? The tibial nerve branches off from the sciatic nerve and courses down the back of the leg, terminating in the foot. The tibial nerve supplies the hamstring muscles, the muscles of the back of the leg, the skin on the back of the leg and on the sole of the foot. The posterior tibial nerve contains mixed sensory motor nerve fibres that originate from the same spinal segments as the nerves to the bladder and pelvic floor. What is Tibial Nerve Stimulation? 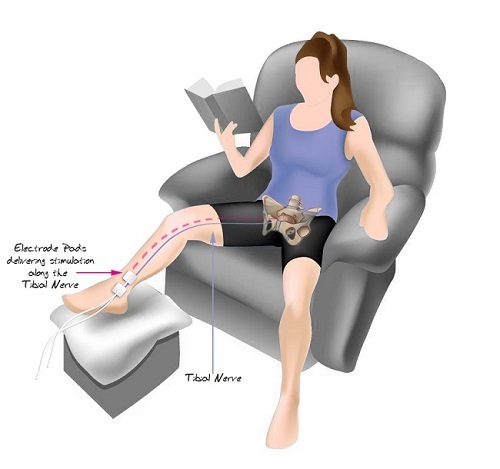 Tibial Nerve Stimulation is the process of stimulating the tibial nerve in the ankle in order to reduce bladder hyperactivity, either through needle insertion or electrode pads. Usually this takes place after behavioural modifications, Kegel exercises and failure of medications. How Does Tibial Nerve Stimulation Work? Tibial Nerve Stimulation is designed to stimulate indirectly the nerves responsible for bladder control. The nerve is stimulated either with a needle (Percutaneous Tibial Nerve Stimulation) or through less-invasive electrode pads (Percutaneous Tibial Nerve Stimulation). When the nerves and the brain stop communicating properly, the bladder or bowels may not function as they should. Tibial nerve stimulation involves a small electrical current that imitates the signal sent to our brain to trigger a muscle contraction. This current passes up the tibial nerve and manipulates a response in the pelvic floor. The electrical impulses travel along your nerve pathways and help to retrain your bladder function, alleviating overactive bladder symptoms. This stimulation of the posterior tibial nerve often produces a typical motor (fanning of the toes) and sensory (tingling in the ankle, foot, or toes) response. Percutaneous stimulation of the tibial nerve is a form of electroacupuncture that involves inserting a fine needle into a nerve just above the ankle. A mild electrical current is passed through this needle and carried up to the nerves that control bladder function. A surface electrode is also placed on the foot. These are both connected to a low-voltage stimulator. Stimulating the tibial nerve via needle is only used in a clinical setting. Percutaneous Tibial Nerve Stimulation (PTNS) treatment usually consists of 12 outpatient sessions lasting 30 minutes each, typically a week apart. Further sessions may be needed for long term relief. Although not yet recommended for clinical use in the UK under NICE guidelines, there have been several studies investigating the efficacy of less invasive tibial nerve stimulation. Transcutaneous Tibial Nerve Stimulation works by using electrode pads solely to stimulate the tibial nerve, as opposed to a needle insertion every week for 12 weeks. In France, one study demonstrated an 80% clinical improvement of overactive bladder syndrome in patients. Many other studies have also concluded that there are beneficial effects of stimulating nerves in the foot in order to control bladder spasms. What are the Benefits of Tibial Nerve Stimulation? Non-invasive – If only using electrode pads to cure your overactive bladder syndrome, then tibial nerve stimulation is completely non-invasive. If you choose Percutaneous Tibial Nerve Stimulation, the procedure is still a lot less-invasive than other surgical treatments that are available. Pain-free – Whether you choose electrode pads or the electric needle to stimulate your tibial nerve, the procedure is commonly painless, producing a tingling sensation at most. High efficacy – The cure and improvement rates of overactive bladder syndrome are typically quite high when the patient has undergone tibial nerve stimulation. In most studies, around 80-96% of patients report that their incontinence has improved and even cured as a result of tibial nerve stimulation. An all-round winner – Tibial nerve stimulation not only helps to treat overactive bladder syndrome but is also recommended by NICE to treat faecal incontinence. How does Kegel8 Use Tibial Nerve Stimulation? With the view to create a non-invasive form of treating the pelvic floor muscles by electrical stimulation, Kegel8 programmed the Kegel8 Ultra 20 Electronic Pelvic Toner for women, and the Kegel8 V for Men Pelvic Toner, to work with electrode pads, in addition to the included probe. Kegel8’s Ultra 20 Electronic Pelvic Toner already incorporates tibial nerve stimulation into its set list of programmes. Packed with 20 programmes to target a multitude of pelvic floor conditions and disorders, the Kegel8 Ultra 20 also has programmes that are dedicated to using electrode pads instead of the more invasive probe. Programme 9, in particular, targets overactive bladder syndrome by using ankle electrodes to stimulate the tibial nerve. You can also use this programme with a probe as well to thoroughly target your pelvic floor. If you’re using the Kegel8 V for Men, programme 6 can help to treat overactive bladder by stimulating the tibial nerve.